Jane Foster version of Thor has been controversial but no one can take away that she goes down in the current Thor #705 in epic fashion. The story will continue from the fall out of her defeat of Mangog and her death in Thor #706. 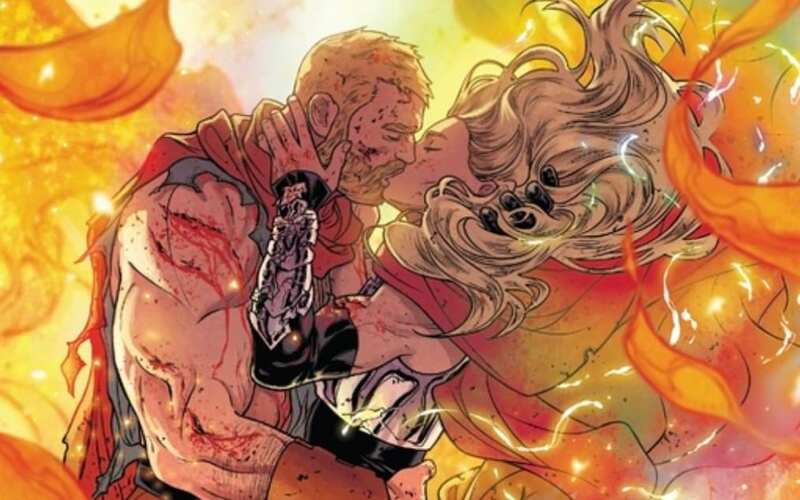 The drama of the current story has made Thor into one of the most interesting comics on store shelves today. The story offers what great Thor stories offer, epic over the top battles with great inner drama and bravery, drilling into the heart of what it is that makes someone a hero. I always think a good Thor story has a cinematic quality and maybe a touch of Rock and Roll. 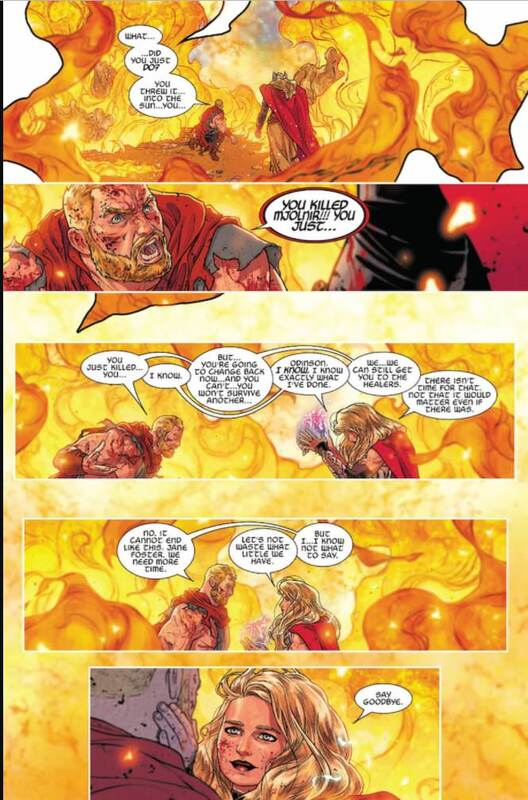 Thor #705 does not disappoint in any of these regards. Thor #705 is on shelves now, Thor 706 will hit shelves on April 18th. 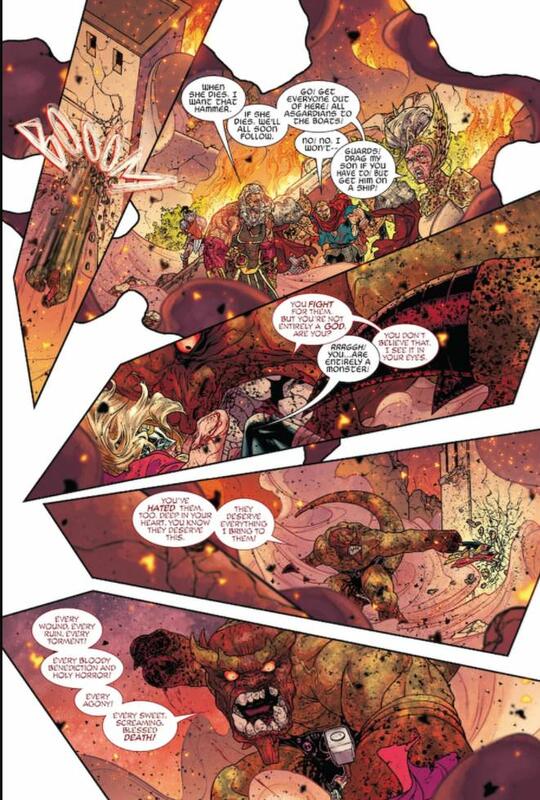 The comic opens right in the midst of action of Thor (Jane Foster) battling the super powerful Mangog. All around them Asgardia is burning and they battle in flaming ruins. While they fight the entire place is rocketing toward the sun. 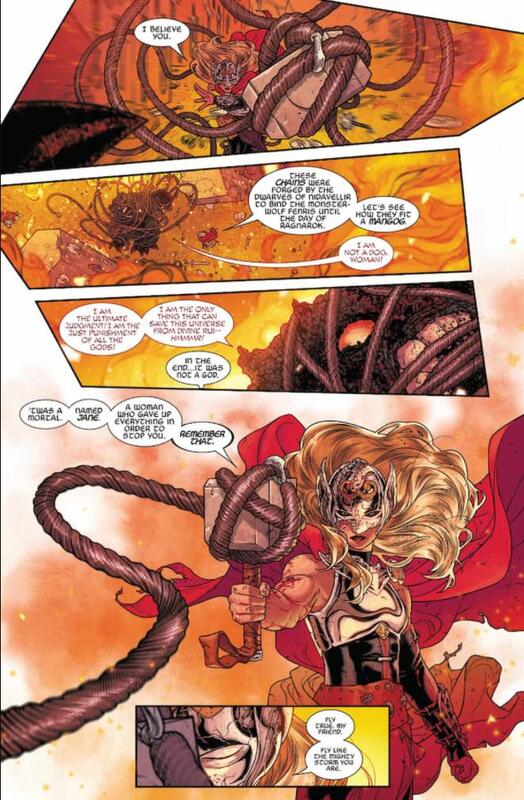 Thor manages to temporaily trap Mangog and Odin and Freya take this opportunity to talk to Thor. They ask her to leave so she can survive. She refuses saying she needs to ensure that Mangog goes down and does not escape. While they discuss this Thor (Odinson) arrives and he says he too will stay and fight Mangog to the end. Thor (Jane Foster) is ultimately doomed as soon as she transfer from being Thor. Odin tells Odinson that he wants the Hammer once she falls. Mangog frees himself and begins to explain why he feels that all the Asgardians deserve to die and questions why a human such as Thor sacrifice herself to save them. She explains that she is not fighting for the gods but for Love. "I fight for Love" she roars as tosses the Mangog toward the sun. Mangog returns though burned and on fire, and royally angry. The battle continues. Thor wraps Mangog into the chians that had been used to bind Fenris and then attaches the chains to Mjolnir and throws the hammer toward the sun. This effectively traps Mangog in rocket going into the sun. Odinson then confronts Jane at first angry that she destroyed Mjolnir but then realizes that she has now no way to survive. Without Mjolnir she will revert back to Jane and quickly there after die. The two kiss as she reverts back to Jane. The kiss continues as the whole city begins to fall apart around them. Odin and Freya watch as Odinson returns from Asgardia carrying the limp form of Jane Foster in his arms.